Your car’s cooling system plays a vital role in keeping the engine and other components working properly and lasting. Proper maintenance on car coolant is important for longevity. 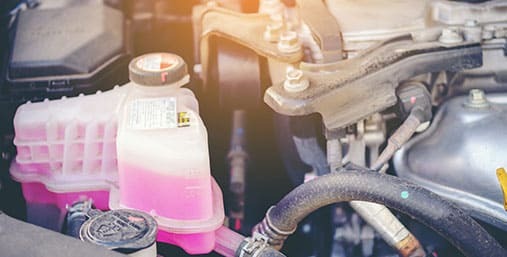 Most coolant has a lifespan of 5 years or 100,000 miles, past that it loses its ability to properly lubricate and protect components inside the engine. When we inspect a vehicle in Poway at Poway’s Precision Automotive, we test the PH of the coolant. This is an accurate test to indicate to the technician if the vehicle requires a cooling system flush. If the car coolant is a PH of 6.5 or less, that indicates the coolant is acidic and can corrode expensive metal components inside the engine. 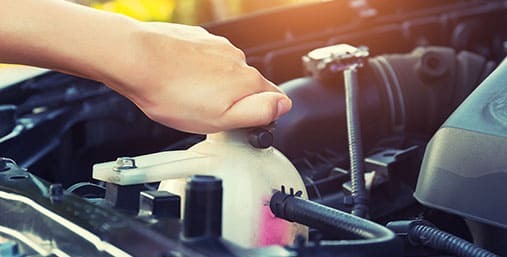 We perform one of the best coolant flush services in Poway by adding a chemical to the radiator fluid before the engine coolant flush, then adding a coolant conditioner to the new radiator fluid after the flush is completed. We utilize an engine coolant flush machine that exchanges ALL the fluid. Other companies will sometimes drain and fill the radiator to reduce costs, but this is not the best coolant flush method. If you are unsure of the last time your car had a coolant flush, come by Poway’s Precision Automotive and we’ll have one of our certified technicians test the coolant.